"This was perhaps the most inspirational show I’ve witnessed in 30 years of attending thousands of concerts, including at least a dozen by Springsteen. There was maybe one better: When he played Jazz Fest in New Orleans after Katrina and turned the city of ruins into a city reborn. But Morello’s lead on “Ghost of Tom Joad” will be forever seared into my conscience as a testimonial, and a hope." Last night the skies of Los Angeles cleared. The storms of the past few days receded only to be followed by the fierce weather of Bruce Springsteen and the E Street Band's Wrecking Ball Tour. The sold out Los Angeles Sports Arena sported a new coat of paint but the ghosts of past political and musical triumphs seemed to hang in the air. With the house lights up, the band entered the arena with the theme from the film The Magnificent Seven blasting. This 1960 American film, directed by John Sturges, is an old-west epic loosely based on Japanese director Akira Kurosawa's iconic film Seven Samurai. Evoking both aging gunfighters and ronin battling for a cause, the band came ready to rumble, opening the concert with Springsteen's Badlands. 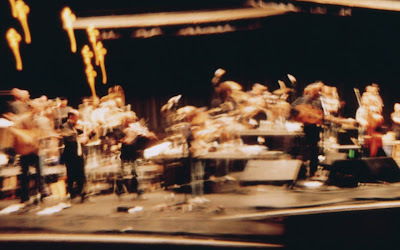 On November 5, 1980 at Arizona State University, the day after Ronald Reagan's election, Springsteen famously expressed just before the E Street Band launched into a ferocious version of Badlands, "I don't know what you guys think about what happened last night, but I think it's pretty frightening." Last night's version opened without comment. But it was clear from the tone of the song and the themes of Springsteen's current album Wrecking Ball that our times are no less frightening. By the song's conclusion, many in the raucous audience were hoarse voiced and dripping with sweat. Laidback L.A.? Hell no. The next song played, We Take Care of Our Own, has grown richer and more nuanced in the live performances since it was debuted at the Grammy's in Los Angeles the day after Whitney Houston's untimely death. Some of the shared sadness of that day has worked its way into the sometimes ironic lines of the song and the audience last night at the Sports Arena belted the refrain with Springsteen and the E Street Band as if in a bid to exorcise the demons of greed and self-centeredness that have haunted our recent history. The night was just beginning and Max Weinberg's superb drumming guided the musical evening. Gary Tallent's, at times under recognized, bass joined with Max's drums to provide a thundering pulse to Springsteen's songs of loss and redemption. Phil Gallo in Billboard explains that the Wrecking Ball Tour is the first "E Street outing without the late saxophonist Clarence Clemons and keyboardist Danny Federici. Springsteen has opted to fill the holes created by their absence with an element no one would have believed was absent, a sweet soulfulness and militaristic percussion. Clemons' brawniness and the wails that evoked moments of isolation and desperation are replaced by a horn section that alters songs moods like lighting, blue on one song, fire-engine red on the next." Springsteen sang the song Wrecking Ball last night like a weathered boxer urging an exhausted opponent to continue an endless well-matched fight for the love of the sport. The audience ate it up and when Springsteen sang the repeated lines "Hard times come and hard times go" in a poignant howl, the young woman behind me laid her arms around me in an expression of empathy. The sacred moment was shared. After this early emotional crescendo, the stakes grew higher. How would the powerful, musical and emotional connection of this evening continue? Springsteen countered all bets by bringing out the incredibly talented and passionate musician Tom Morello. Beginning with Death to My Hometown, Morello joined Springsteen on stage for four powerful songs spread throughout the night. Morello's searing guitar solo closed Jack of All Trades a few songs later. When he wasn't on stage, Morello sat with his family, close to the edge of the stage, and according to nearby concert goers sang along exuberantly with nearly every song. A key moment of the evening was found in this tours' premier of Something in the Night. As on the Darkness album, the band next crashed into a thundering Candy's Room. Without missing a beat at Candy's conclusion, Springsteen yelled out to the band,"She's the One." Jake Clemons, Clarence Clemons' nephew, blistered the saxophone solos in She's the One and held his sax aloft in triumph at the song's end to roars of affirmation from the crowd. "We've been watching Bruce Springsteen and the E Street Band play in concert for decades, and it seems as if he and his crew get better with every tour. How? With few rare exceptions, aren't rockers supposed to kind of get stale once they get older? 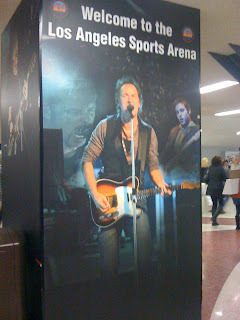 Whether it's today's troubled zeitgeist or solid new material from the album Wrecking Ball or the recent passing of longtime saxophonist Clarence Clemons, Springsteen was inspired and inspiring in a nearly three-hour show, once again making fans at the Los Angeles Memorial Sports Arena true believers in the power of rock 'n' roll." 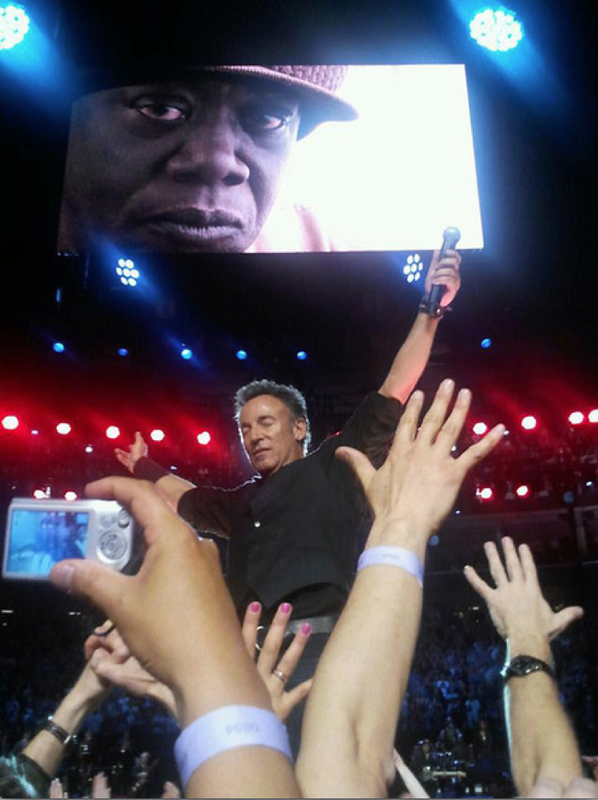 For me, the continual growth in Springsteen's concerts is his extraordinary ability to push his art to the edge. Sometimes it involves stripping his music down to the barest essence. Other times, as on this current tour in support of Wrecking Ball, Springsteen adds to his sonic arsenal by bringing in a full horn section, backup vocalists and extra percussion to play off of Max Weinberg's bedrock drumming. "Then stroking, beating, hugging and pounding his custom ... guitar, Morello made it a sword, a trumpet, a beat box, a megaphone. It was an ear-shattering, time-stopping performance to which the audience played mesmerized witness. 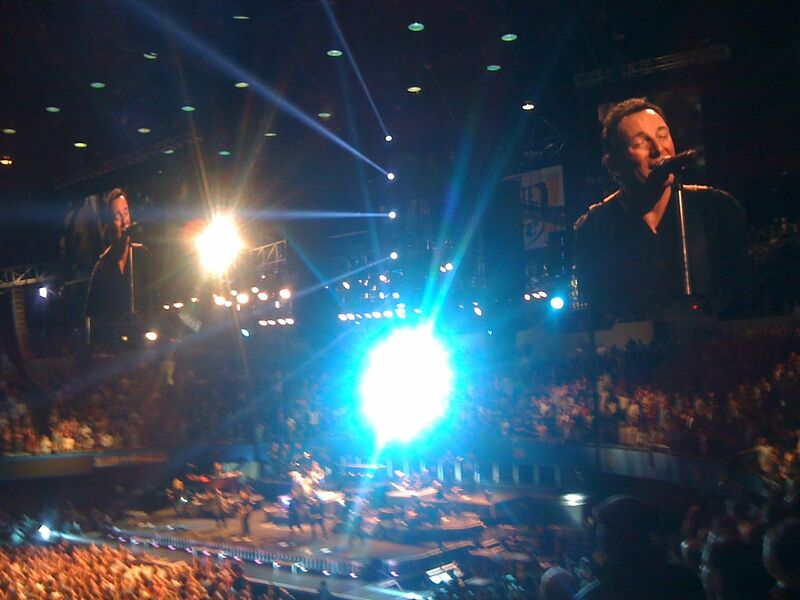 Tom Joad was there, and Clemons, and deceased E Street keyboardist Danny Federici too." Land of Hope and Dreams brought the train into the station for the encores which ranged from the gospel beauty of Rocky Ground, to the surf guitar of a Ramones inspired cover of California Sun, to Born to Run, to Dancing in the Dark, and finally a celebratory and elegiac Tenth Avenue Freeze-out. A Springsteen concert is a shared experience of mourning and communal rebirth. Joan Walsh writes in Salon that,"If there were a church like this, I’d be there every Sunday." Springsteen and the E Street Band play again tonight in Los Angeles and then the Wrecking Ball Tour moves on to New Orleans for the Jazz Fest on Sunday. Joan Walsh encourages us to jump on this train,"If you can see him this Sunday in New Orleans, do it. Experiencing this show in the land of stately above-ground cemeteries and glorious marching-band funerals, as well as Hurricane Katrina and the Superdome, might be the ultimate way to experience this sad, heroic, redemptive tour." "We lost Levon at 1:30 today surrounded by friends and family and his musicians have visited him. As sad as this was, it was very peaceful." As a fitting send off for Levon Helm please watch The Band Perform "The Night They Drove Old Dixie Down" from Martin Scorsese's Film "The Last Waltz." Rest in Peace Levon Helm! **APRIL 19TH, 9:30-11:30am, San Diego State University. --Upholding Universal Ethics & Compassion in Challenging Times.-- To access the webstream, please visit <http://sdsu.edu/> on the day and time of this event. **APRIL 19TH, 1:30-3:30pm, University of San Diego. --Cultivating Peace & Justice.-- H.H. Dalai Lama s talk will be streamed online at <http://www.sandiego.edu/dalailama/media/> at 1:30pm on April 19th. I am sad to report that Levon Helm, who has played drums and contributed lead vocals while in the groundbreaking musical group The Band is "in the final stages of his battle with cancer." Levon's website notes, "Please send your prayers and love to him as he makes his way through this part of his journey. Thank you fans and music lovers who have made his life so filled with joy and celebration...he has loved nothing more than to play, to fill the room up with music, lay down the back beat, and make the people dance! He did it every time he took the stage." Rolling Stone writes that ,"Helm was diagnosed with throat cancer in the late 1990s. He recovered, but it took him many years to recover his singing voice. At the Rock and Roll Hall of Fame induction ceremony past Saturday evening, Robbie Robertson sent "love and prayers" out to Helm." Outrageous. By now you've heard that the GOP has put up fake democrats to run against me and 3 other democratic challengers in the State Senate recall elections. This is yet another insult to Wisconsin's proud tradition of clean elections and we need to fight back. My fake Democratic challenger is Gary Ellerman. He's a life-long Republican and founder of the group, "Walkers for Walker." The Democratic Party of Wisconsin filed a complaint with the Government Accountability Board alleging that these Republicans are committing felony election fraud, by collecting nomination signatures under false pretenses. This morning I gave a statement to the Board. "...If you allow a Republican to appear on the ballot as a Democrat, you’re saying that it’s acceptable to place false information on a ballot. This would undermine citizens’ confidence in this process specifically and in government in general. I think it’s telling that after all the talk of election fraud at the polls this past year, we’re now facing fraud on the ballots themselves." However, moments ago the GAB announced they will allow these fraudulent candidates to remain on the ballot! What's more disturbing than having to run in a primary against a fake candidate is the confusion this is causing among citizens in our district. When I was knocking on doors this weekend, I spoke to a woman who was confused and upset about all the news of these fake Democrats. She was concerned that there will not be an indicator of who the fake Democrat is and even went as far as asking if I had proof I was the real candidate. 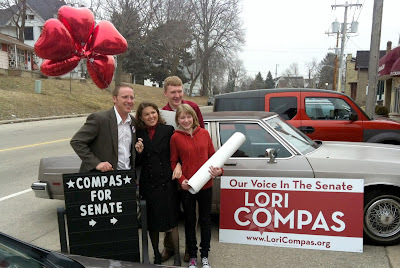 Make no mistake, this is intentional chaos being created by my opponent and the the Wisconsin Republican Party. It is more important then ever to get our message and the truth out to people in the district. Can you donate $50 today to help us reach more voters? Volunteers continue to knock door-to-door and speak with friends and neighbors, and as I continue to meet hundreds of folks one-on-one and in small groups across the 13th District. But we must also spread our message in other ways. We need to buy radio ads and send direct mail. This is expensive but critical to reaching a broader audience. It's particularity important in order to reach more people rural areas where it is not realistic or efficient to send volunteers door-to-door. Please help us reach as many voters as possible by giving a donation today! A donation of $100 will allow us to send a mailing to 300 people. Can you help us reach those people? P.S. You can read my full statement to the GAB today here. Thank you for helping me fght for open government, civility, and a bi-partisan commitment to progress.